currently receiving 6626.3 "Rainy" and 6700.5 "Hexie 2K"
Have you heard the 3rd beacon mixed in with Rocky/Rainy? I have not but I hope that I can catch it! Many of these beacons move around a bit in freq, so the relative frequencies of this trio can be different at different times. Here is a spectrum shot of Rocky, Rainy, and the Unknown ditter. At the time of this image Rocky was centered on 6626.7, Rainy on 6626.4, and the Unknown at 6626.2. I think this unknown has been there a while, just not reported. 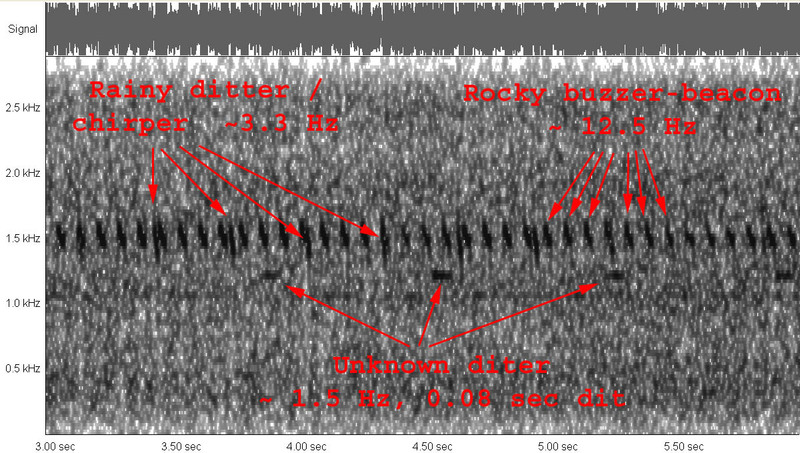 I would have to look at old SDR recordings to try and come up with a time frame, unfortunately Rocky / Rainy is one I tune to often, but almost never record. After a little while I did recognize the crappy frequency stability of a lot of the pirate beacons. I've been inconsistent about reporting it here as I was more about just logging that it could be heard in my location at certain times of day. Now that I have the PX3 display it does not matter what mode the radio is in as I can rapidly spot signals without having to tune around. My monitoring location is urban-noisy so it takes days with great propagation to hear a lot of these. 2143 and Rocky is gone, all that remains here is Rainy and the Unknown.